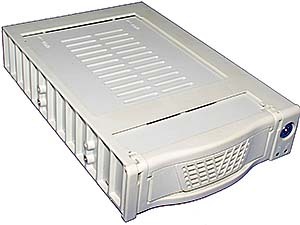 You need several Removable ATA/66-133 Enclosure w/Lock/Fan/LED ($7.15) Also available in black and spare trays are available for a few bucks less. One of these racks will mount a hard drive. But they don't provide enough cooling for modern hard drives. We will take care of that later. You need a USB 2.0 to IDE adapter. 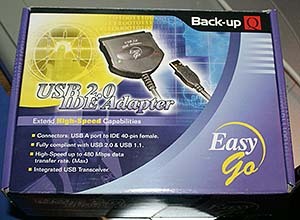 I used a Back-up Q EasyGo USB 2.0 to IDE Adapter Cable I got mine from Computer Geeks but they seem out of stock now. Hence, the Google link. If you don't want to use this then get the cheapest USB 3 1/2" drive enclosure you can find (around $20) and use the USB-to-IDE electronics that are in it. 30 seconds with a screwdriver should do it. Just make sure to never actually mount a hard drive in it. Because they have no way to cool the drive and this is how drives get cooked. 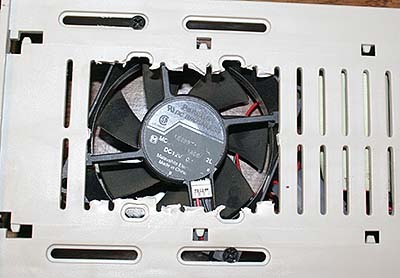 You need an 80mm fan with a 4-pin molex power connector. Available anywhere. (Best Buy, Staples, any web order computer supply house. You should have some spares anyway, on general principles. Fans are rated in the amount of air they can move. CFM (Cubic Feet per Minute) You don't need a high capacity fan for this, because of the close proximity. Something below 30CFM will do. Above 30 CFM is OK, it will just be noisier than needed. 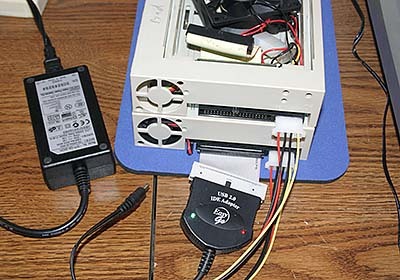 You also need a 4 pin power splitter to split the power supply to drive both the fan and the hard drive. Again, should be easy to find and you also have some of these on general principles. For when you are adding hard drives and such. A USB 2.0 card in your computer, if you don't already have USB 2.0. You really don't want to use a hard drive with poky USB 1.1. Trust me on this. We use one of the mobile racks/trays to mount the 80mm fan. This is the whole point of this: a way to get some decent cooling to the disk drive. 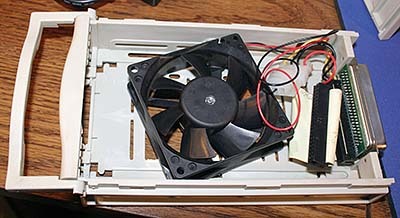 An 80mm fan has a lot more cooling than the itsy-bitsy fan that may be installed in a commercial external USB drive enclosure. Get some destructive tools and break out a space on one of the mobile racks and mount the fan. I used a pair of heavy duty needle nose pliers and a pair of cutting pliers. Put the mobile racks in their cases. Use the key that came with the racks to lock them, or else they won't work. Connect the power cables (but don't plug it into AC yet. Plug the USB 2.0 adapter into the mobile rack that has the hard drive. Power them on. The green LED should light up on the front of both mobile drives. Plug the USB 2.0 cable to the USB 2.0 adapter and then to your computer. If you are using Win 2K/XP, it should show up and just plain work. Ditto if you installed the USB 2.0 drivers in Win 98. After it has run a little while, carefully lift the top rack (with the fan) and feel the top of the disk drive. It should feel cool to the touch. If you don't put the fan down, the hard drive would probably hot up (which would be bad.) Cooling == good. If you want this to look a bit spiffier, find an old junk AT computer with a few 5 1/2" bays and mount the mobile racks in the computer case. 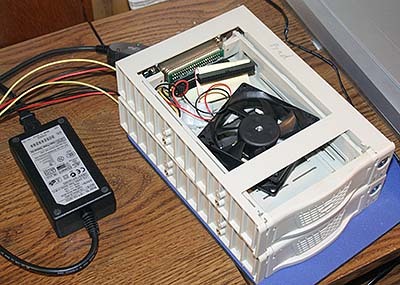 Use the computer's power supply to power the drives and fan. Disconnect power to everything else in the computer. You don't need the power adapter that came with the USB 2.0 adapter because the computer power supply powers the drive and fans and USB 2.0 itself powers the USB 2.0 adapter. At least it does with the one I have. If you only have an empty case with no computer power supply, then use the power supply that came with the USB 2.0 adapter. The advantage of the computer supply is having the power switch on the computer. If you are mounting in real 5 1/2 drive bays, there are fan mounts that are designed to suspend one or two 80mm (or larger) fans, so that you wouldn't need to butcher a tray. But these fan holders are hard to find and sometimes cost more than the mobile rack. But anything that works will do. The point is to suspend an 80mm fan above the hard drive. 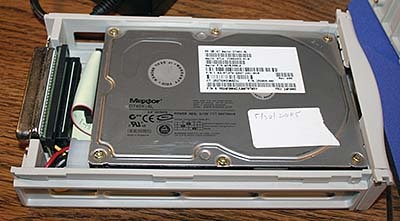 Dinky small fans that they sell as "hard drive coolers" 1., don't provide much cooling and 2., don't last very long before they wear out. The rack trays have 40mm fans. I'm ignoring them because they provide minimal (zilch, actually) cooling and wear out real fast. I've had a lot of these fans fail when I was using these racks with older slower drives (30 gigs and smaller) that didn't need much cooling.